As a textbook definition beauty-holic (which, sure, let's pretend is an actual word) I am constantly looking for the next best product on the market. While my wallet might not love my desire to try out tons of different products, as a beauty blogger I can say that there's no better feeling than finding a product that really works for you. So when the lovely Allison of Mercuteify and I discussed a teaming up for a post, I was thrilled when she came up with the idea of writing about our best beauty discoveries of 2015 so far. These past few months have been real skincare heavy for me because my skin has just not been getting on with this winter weather. The upside of that is I've discovered a few of my favorite skincare brands ever, and they have completely changed my routine for the better. I'm speaking, of course, about Verso Skincare, Gressa Skin and Aqua Reveal. I know I've written in depth about these brands in past posts so I won't bore you with a long love letter to each again, but the products from these three brands have helped change my skin for the better. Honestly, when it comes down to it I have trouble picking a favorite from each of the lines...But if I had to, I'd go with my much raved about from Super Eye Serum Verso, the product that has single handedly taken my under eye circles from darker than dark to almost human looking. They're brighter than they have ever been in my life, and since using it I have been asked far less "are you feeling okay? "s than ever before (a small miracle). From Gressa I would choose their incredible Purifying Oil*, a concoction of oils such as Rosehip and Jojoba that work to diminish fine lines, hydrate and soothe your skin. I've been mixing a few drops of this guy with my day and night creams and my skin has never looked clearer - it's fast absorbing and just leaves you plain glowing. Finally, from Aqua Reveal I'd choose their Bright Satin Water Peel for Face*. I didn't think I would ever find an exfoliant that could get along with my sensitive skin, but then I was introduced to this incredible line. It straight up takes away any dead skin from your face while simultaneously soothing and treating it, leaving behind zero redness or irritation. I mean, you can even use it under your eyes, just how cool is that? 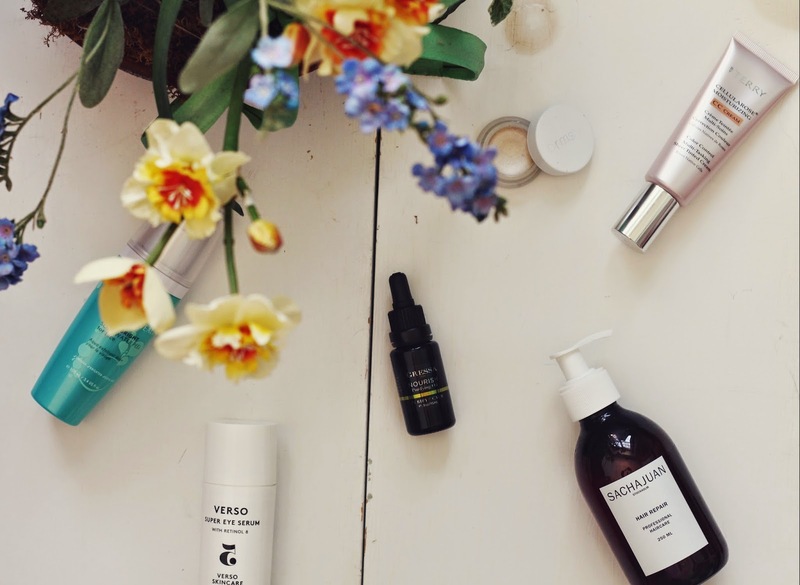 While the vast majority of my favorite discoveries so far have been on the skincare variety, that doesn't mean I haven't found some other incredible beauty products. My favorite makeup discovery far and away this year has been my recently written about RMS Living Luminizer. Can a highlighter be dewy and illuminating without making your face look like a glitter bomb explosion (a la Britt from The Bachelor)? That was my misconception on highlighters until I found this total gem. I often put way too much on, because I just adore it so much, but it's totally forgiving and just sinks into your skin to add the perfect level of ethereal glow. Then there's the Sachajuan Hair Repair, a product I never knew how much I needed in my life. The entire Sachajuan line is kind of scary good, but if I had to choose one product this would be my standout. I'll admit that before this year, I was a bit of a haircare virgin. Yes, I own a curling iron and hair dryer, but that was about my extent (which sounds sort of sacrilegious coming from a beauty blogger). Starting to use Sachajuan products totally opened me up to the idea of high end hair products, and how amazing your hair can look when using the right ones. The Hair Repair is one of those products - using this once a week as a five minute hair mask will leave your hair feeling softer (and smelling better) than you ever thought possible. It opened me up to the line as a whole, and my hair and I have never looked back. So with all of these amazing product discoveries, I feel I need to talk a little bit about some of my favorite new bloggers, some of whom have actually introduced me to a few of my previously mentioned products. First up has to be Grace from That Grace Girl, the blogger who I forever will be thanking for introducing me to the wonders of Verso. If you haven't checked out her blog already I implore you to go take a visit - I promise it will soon be in your bookmarks. Aside from the wonderful photography and writing, she truly knows about some of the best products to recommend in the business. Every product I've ever bought off of her recommendation (which has been quite a few) has turned out to be wonderful, and I wholeheartedly trust all of her recommendations. Then there's Holly from Bloomin' Rouge, the most recent of my three discoveries. Not only is this girl stunning, but she is absolutely hilarious and her posts always have me laughing to myself (because I'm that girl who sits at her computer laughing alone to herself at blogs). Anyways, aside from being my total blogger crush, she also has insanely beautiful photography and some of the most helpful blogging posts I've ever read. I discovered half of what I know about CSS from her, and I am forever grateful. Finally, I need to mention my favorite YouTuber Hannah Maggs, a beauty blogger/vlogger who has some of the most beautifully edited vlogs to be found on the web. She, her husband and their adorable baby boy record weekly vlogs that are posted each Sunday night, and they are such a joy to watch. Hannah and her husband are hilarious and I absolutely adore watching their vlogs each and every week. Hannah is also a makeup artist, recently posting her everyday beauty routine which was lovely to watch. Now go head over to Mercuteify to check out Allison's best discoveries. If you haven't visited her blog before, you're about to discover a new favorite. Seriously, she's gorgeous and has some of the best photography and posts out there. I have discovered some of my favorite brands through her and cannot wait to see for myself what products she's chosen!